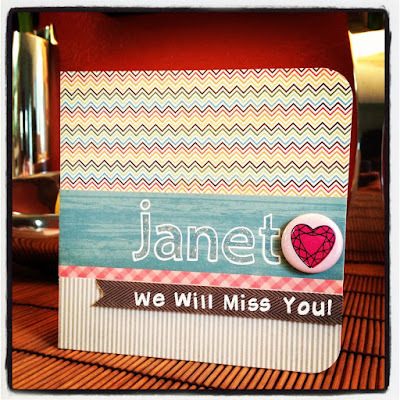 Janet, We Will Miss You! Am I still a card blogger if I haven't blogged since August 2nd? I still consider myself a blogger. Life has gotten in the way: volunteering at school and having work done to the exterior of our house. I have made cards during the summer, I just haven't posted them on this blog. Well I'm back today. 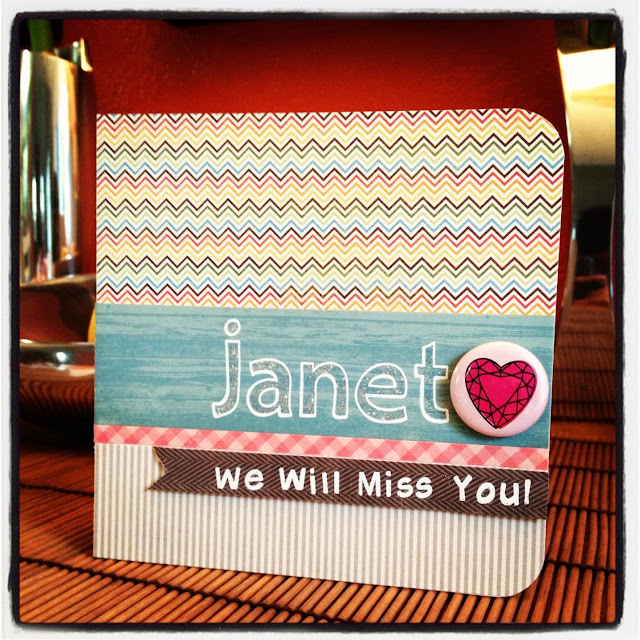 I made this card for a dear friend at school, Janet. She and her family are moving to Salt Lake City very soon and all the volunteers and staff at school are really going to miss her. She was such a great volunteer in our library and all other events we had. We took her to lunch on Friday at a really good Vietnamese restaurant I'm town. The stamps I used are all from Lawn Fawn: Quinn's ABCs and Harold's ABCs. The papers are from a great paper pad from My Minds Eye called Dolled Up. The heart button is from an older American Crafts flair collection.